It’s that time again isn’t it? You know; the one where we’re all filled with enthusiasm about getting fit and healthy and losing weight and… Or have you already given up on all of that? Well, whether you have or not, we’ve got a great recipe for you in this post. 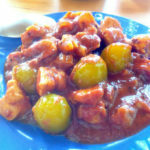 Traditionally Turkish, very easy to make, seasonal, tasty and healthy, too. We’re going to make karnabahar yemeği. 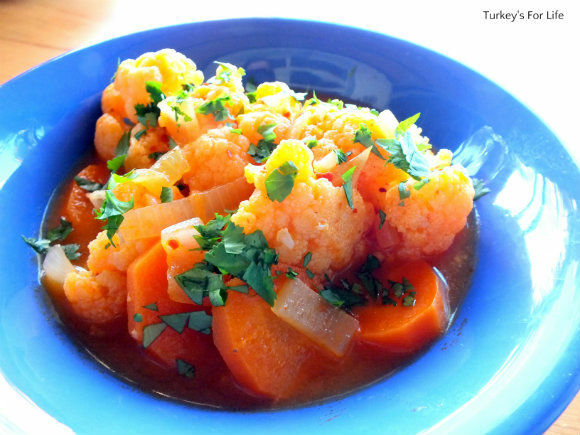 And the best description we can give you for that is Turkish cauliflower stew. 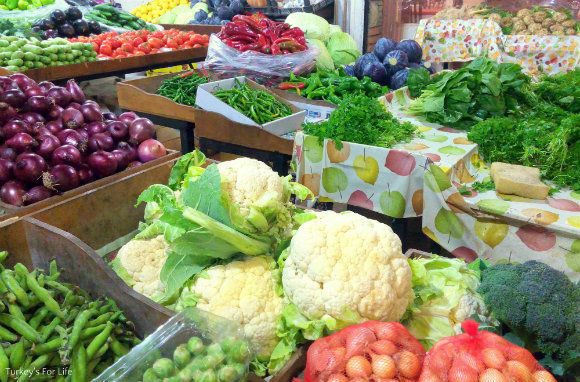 We’re still enjoying our winter veggies and cauliflower is still in its prime on the markets of Fethiye. We need to make the most of it! Often, we’ll do a roasted cauliflower recipe or an Indian dish. But this winter has been all about the basic Turkish cauliflower stew. ‘Cauliflower stew’ sounds as though this is a dish that needs to cook in the oven over a few hours so it’s not really the best translation. We’re using a pan and your meal will be ready to eat in less than 30 minutes. But, as with our difficulties in coming up with an English translation for our et sote recipe, there’s only so many words we can work with. So, ‘cauliflower stew’ it is. 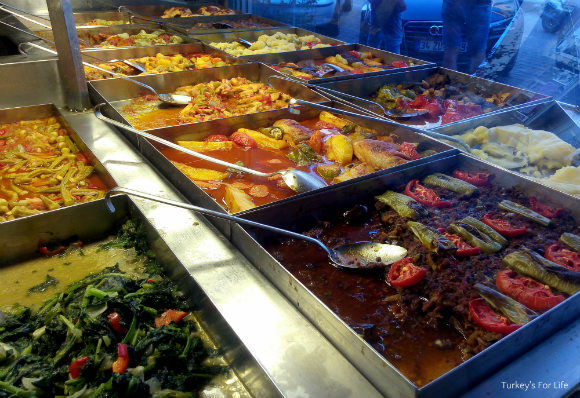 If you’re like us and you love going to lokantas, you’ll know there is often a bain marie rammed with treats from the traditional Turkish kitchen. In Fethiye, lokantas around the otogar like Seçkin have oodles of choice. In the old town of Paspatur, Meğri Lokanta has pretty impressive display, too. And amongst all the meat dishes, there’s always a more than appetising selection of seasonal Turkish vegetable dishes, too. If you’re not the best at getting your healthy fill of vegetables, lokantas are the place to start practising; teaching yourself and realising that, wow, this is actually really tasty. 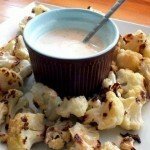 In winter, cauliflower – in some form – is very likely to be present in the bain marie. Karnabahar yemeği – Turkish cauliflower stew – is a favourite. Don’t forget; with a lokanta, you’re gonna have lots of other dishes on your table, too. For this post, however, we’re just celebrating healthy cauliflower recipes! This is karnabahar yemeği all on its own. Eat it as a light lunch or, if you check at the bottom of the post, we give some tips for making cauliflower stew a tad more substantial. Anyway, let’s get down to business with another of our easy cauliflower recipes: Turkish cauliflower stew. 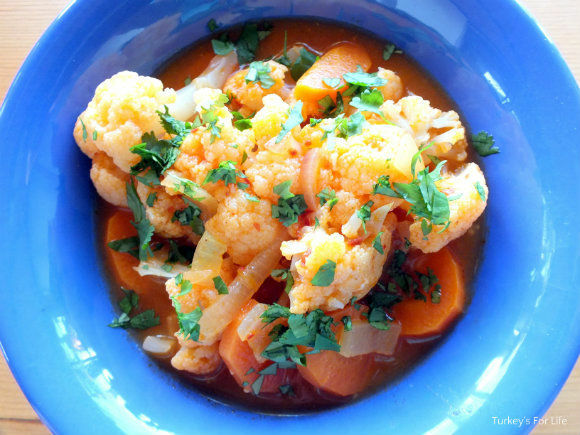 If you're looking for healthy cauliflower recipes, this Turkish cauliflower stew is delicious as a main meal or an accompaniment to other dishes. In a deep pan, gently heat your olive oil. Once hot, add your onion and saute until it starts to sweat. Now add your carrots and stir them round. Keep the pan on a low heat and gently saute for 5 minutes or so until your carrot begins to cook and soften. You can add your chilli flakes, salt and pepper at this point, too. Meanwhile, put your salça into a cup and add boiling water or vegetable stock. Stir until the salça dissolves. Add your cauliflower to the pan along with the dissolved salça. Now add enough hot water or stock to cover the cauliflower florets. Stir everything around, bring to the boil and then simmer until your cauliflower is soft. Serve in a bowl and top with your freshly chopped parsley. As with all of our recipes, calorie count can vary slightly depending on exact weights and measures. You can bulk this cauliflower stew recipe out in winter and make it more comforting with the addition of chickpeas, rice or potatoes. And there you have it. It’s that simple. If you’re on the hunt for easy cauliflower recipes that are healthy, too, well this one has got to be up there, hasn’t it? Oh, and for those of you who like more fragrant flavours; it is traditional to top your cauliflower stew with freshly chopped parsley. In our servings, we use chopped, fresh coriander instead. Cauliflower and coriander are perfect together. Lots of people, including us, love to play about with recipes in the kitchen. And with karnabahar yemeği, because it’s such a simple recipe, it can be tempting to start playing with flavours. You can, of course, but then it won’t be the simple, delicious Turkish dish it’s supposed to be. If you want to play around with ingredients but still keep your recipe traditionally Turkish, keep the cauliflower recipe above as your base. It’s a light recipe, so, sometimes, other comfort ingredients are added. You can add a couple of handfuls of chickpeas or rice. Or, in the depths of winter when we need a bit more ‘comfort’ going on with our cauliflower stew, add a chopped potato at the same time as your carrots. A handful of giant prawns sounds like a good add to me. Interesting, BacktoBodrum! 🙂 Love prawns but not sure I’d want them with cauliflower stew. But, of course we trust your cooking – 😉 – so might just give that a try! What a simple but beautiful, delicious meal. Realised I had no tomato paste after starting the recipe so used a tin of chopped tomatoes .